Out for seven of his last eight games due to what had been characterized as an “ankle contusion,” RealGM is reporting that Dragan Bender will miss the rest of his rookie season with ankle surgery. Although John Gambadoro of Arizona Sports 98.7 reported that there is no timetable for his return and it is not necessarily season-ending. Dragan Bender is having ankle surgery today but timetable to return to play is TBD. It is not a certainty that he is out for year. Not having the type of statistical year that most would expect from a 4th overall pick, Bender was only averaging 3.3 points and 2.2 rebounds with a 37.1 FG% and 32.1% from beyond the arc. Never a starter, Bender played in 38 games each coming off the bench, often playing the stretch four whose purpose was to stand around the arc waiting for a kick out pass and three-point attempt. This role seemed to under-utilize his particular skill set as his ball-handling skills are impressive for a big man and he only averaged 2.7 turnovers per 100 possessions. Bender showed plenty of athleticism on both offense and defense that proved his role could and eventually will expand into something much more vital. Though not a point-four, it certainly would have been more interesting to see him moving about the court more actively rather than often being planted in one spot on offense. Bender’s best game of the season came against the Houston Rockets back on December 26 when he recorded his first career double-double. Dragan scored 11 points and grabbed 13 boards, but rounded out a full stat line with 2 assists, 3 steals, and 2 blocks, in 26:38. Those 11 points remain his career-high and he has scored 10 points on four other occasions. He has not reached double-digit rebounding on any other occasion. His career-high for three-pointers made in a season is 2, which he has set and tied five times. With seven games before the trade deadline and the Suns fighting for the #1 overall draft pick in this summer’s lottery, chances are his loss will not effect who or what Ryan McDonough targets in potential trade deals. 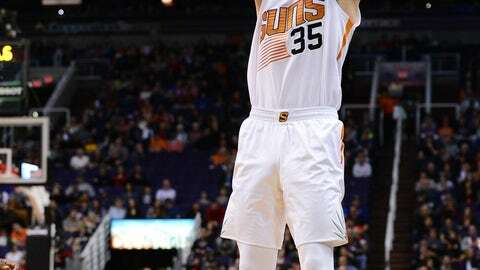 Bender’s position on the roster would seem to be pretty much set moving forward, and the Suns will not be in any rush to replace him on the roster, given his already abbreviated role. Should the surgery end his season, it will be interesting to see if this extra time off to heal will be utilized with the express consent of improving certain aspects of his physical and athletic game. Still 19 and obviously very young and growing, Bender is not at the strength that is expected of an NBA player his size and needs to build his physique to take the beating and give the beating that would be expected of a seven-footer. With added strength and greater confidence in his outside shot, Bender could be looked to as having a significant boost in his game next season better exemplifying the abilities that are expected of a fourth overall pick.